We specialize in new construction, but we are happy to take on renovation projects as well. For your convenience, we can collaborate with your general contractor, architect, interior designer, or any other professional that you are already have working on your project. What separates us is the quality of our work and the hands on, one-on-one attention you will get with our amazing customer service. There isn't any kind of stair or railing that we haven't built or installed. Give us a call today! stairplane® ARCHITECTURAL STAIRCASES We manufacture unique designer staircases that contain not too much and not too little. This principle allows engineered designs for which there is nothing comparable on the rest of the market. We don’t imitate, we invent. The base of our staircases is anodised aluminum. Our goal is to continually develop stairs that can be installed in the most diverse interiors, ranging from very modern and contemporary to more classical and even rustic. Besides staircases, we design and supply complementary glass railings, landings, bridges and handrails, made of anodized aluminum, stainless steel and safety glass. oneplane® FRAMELESS DOORS Insensation fulfils its goal of ‘Mastering Minimalism’ by bringing you the most aesthetic solutions for frameless doors. Available in frameless swing and frameless pocket versions, our frameless doors provide the highest level of installation comfort. Projects around the globe speak to our excellence in this area for almost two decades. convex® ARCHITECTURAL DOOR HARDWARE Architects the world over specify our door hardware – unique, high-quality, aesthetic door levers, locks and accessories, designed and manufactured in Europe. Twenty-Six years of design and manufacturing experience guarantee you a long-lasting result. We set the bar very high for our designs. We develop staircases that are both durable and timeless, our ultimate goal is to bring a considerable added value into your projects. Our products are manufactured in standard US and European sizes, as well as custom sizes and finishes. Delivery times and prices are extremely competitive. Your quotation will arrive in less than 48 hours. We aim to be your favorite staircase and frameless door supplier with the best-in-class doors and staircases which will give your rooms the ‘wow’ effect. Legacy Stairs & Millwork, Inc.
Legacy Stairs & Millwork makes your unique vision come to life by creating custom stairs and railings of the highest quality and design. We proudly produce the finest custom staircases for both residential and commercial uses and provide expert installation services. Our highly experienced staff exhibits both professionalism and knowledge of the trade. As a family business, we value our employees as an extended part of the family and recognize the amazing talent that lends itself to our legacy. With over 30 years of experience in the stair and rail industry, Steve Hasse founded the company on the basis that the finished product is nothing short of perfection. Steve strives to incorporate the latest technology and the best innovative techniques in stair building in order to foster a progressive and ambitious culture for the business. Contact us today and we will be in touch with you shortly to help with your project. Based in Hoboken, New Jersey and established in 1987, Marty Anderson & Associates, Inc. is known throughout northern New Jersey and Manhattan for quality wood stair and wood railing repair & rebuilding. We also enjoy a fine reputation for our design & build cabinetry! In addition to repair and retrofit, we also can fabricate and install new wood stairs and new wood railings. Based in New York, Old World Stairs and Restoration is a trusted name for any staircase related work in the Manhattan, Brooklyn, and New Jersey. We specialize in wood and iron related work including millwork, carpentry, restoration, renovation and more. We provide custom made high-end and low-end styles in all forms of iron work. All of our iron work is fabricated in our own shop by experienced fabricators. 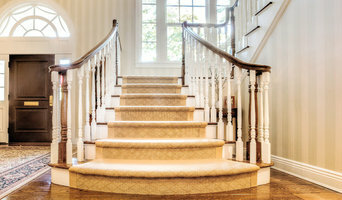 At Old Wood Stairs and Restoration, we provide excellent staircase restoration service. We can revitalize the charm of all types of staircases no matter the style, size, or material. If you are planning to install a staircase in your house then we are the people you should hire to undertake this project. The professionals at OWS are masters of manufacturing and installing staircases. When it comes to your home, you have every right to design it the way you want! 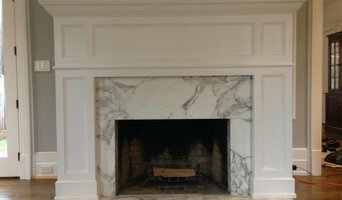 At OWS, we revel in making the dreams of our clients come true using our custom millwork. We possess thorough expertise in custom woodturning, and we design and manufacture turnings to exact specifications. We pride ourselves in creating a wide variety of wood turnings. 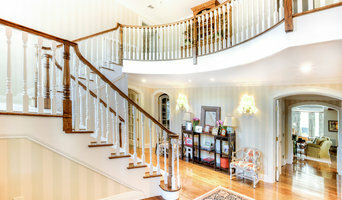 We provide custom staircases that enhance the beauty of your house. We can transform your old staircase into a beautiful and elegant centerpiece. And we can do all this within your budget. Our business is built on a foundation of steadfast commitment to client satisfaction. You get the results you are promised. J & J Elite Carpentry Inc.
For over 70 years, Stillwell Stairbuilders has designed, fabricated and installed custom wood stairs for architects, builders and homeowners. We combine old-world craftsmanship, innovation and modern technology to provide custom wood stairs that are functional, aesthetically pleasing, and meet local building codes. Railing Co is a company that offers high-quality European and stylish railing systems for stairs, balconies, and patios. We present various designs (including glass) of rails and multiple color options to suit your style to decorate the home or commercial buildings. Balcony railings and outdoor stair railings have unique appearance and durability to the different environmental conditions. Indoor stairs railings provides a special sense of high aesthetic and elegance. Installing railings on the steps of your home or business is easy and not expensive (installation available). Stairway to Heaven of New York, Inc.
We are fabricators of modern stainless steel ,tempered glass panels and cable wire railings.Our high performance of finished products provide the precision and expertise for all of your custom railing requirements. Exclusive Iron Works takes pride in three generations of an iron forging tradition passed down from generation to generation. We are your professionals for any custom ironwork that you are looking for for your household. 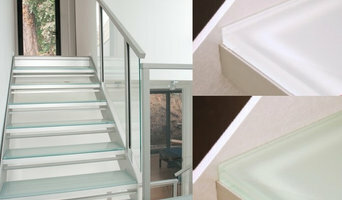 We also specialize in custom staircases and railings to help bring a custom feel to your every day life. Choose between Contemporary, Old World, Art Deco, Colonial, Modern, Mediterranean, Celtic or Tuscan. Work with one of our artisans to create a design of your own vision or choose one from our extensive product line. Create a memorable design in your home or business with Exclusive Iron Works. You will enjoy the process as well as the product! With over 20 years of experience, Design Interiors has become one of the most reputable and trusted custom-stair producers in the Tri-State area, amongst homeowners and contractors alike. Our experienced team puts the customer first, making the entire process from conception to completion, simple and stress-free. Whether replacing outdated stairs or custom designing a magnificent new system, our combination of wood, metal and glass will become the perfect addition within your home or office.